Outsourcing projects has become a major activity and highly profitable option for companies to have an advantage of price by increasing profitability and reducing the expenditures. We at DATA INFOVISION (IT Outsourcing Company India) understand the clients outsourcing requirements and can act as an outsourcing unit for the clients to help them achieve more profit by providing the services at affordable rates. It helps to gain a competitive edge on competition. Outsourcing methodology involves need assessment, service level assessment, and requirement gathering. Service level assessment, and requirement gathering Obtaining complete information for high success rates, our team acquires all necessary information about the proposed process or project. Similar models of the processes, services, and projects and analyzed to test the feasibility of a recommended module. Evaluation, Estimation and Finalization received recommendations are evaluated and project estimation is drafted for finalizing the outsourcing process. 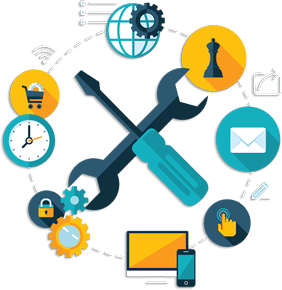 Data Infovision Application Maintenance Services provides you with the ability to change functionality, appearance, and other areas of your software's performance and capabilities. When you choose Data Infovision Application Maintenance Services, you are assigned a dedicated team having a deep expertise in your application and an understanding of your line of business. To check your website has any broken links, all kinds of errors in designing and programming, testing contact information forms. Constant update with the most recent information about your business. Ensuring that all images in the website along with the links, and files are there on your website, and your website is always accessible to everyone. As new technologies have been introduced in teaching and learning processes; e-learning systems are increasingly being used. It is an easy and interactive way of providing high level training or education to the staff and/or students in an organization and/or some educational institute. This allows an interactive learning system that is more proficient way to train anyone from any location. Customer Relationship Management is an understanding of how to manage relationships between the customers, track the reports and analyses the research in a systematic and organized fashion. Many people think of CRM as a technology or software, but in reality it's a holistic approach, comprised of methodologies, software, Internet capabilities and even sociology and psychology. There are three key elements to our successful CRM initiative: people, process, and technology. We are skilled in proposing our clients best features for CRM and managing your contacts more efficiently. Our experts place the customer's needs and interests first. Also provide Sales, Service & Marketing modules and ERP modules for Inventory & Projects.Helping a venture to allow its marketing departments to spot and board their best customers, manage marketing campaigns.